I was standing in line at Randalls last week to vote when tears came to my eyes. I was scanning the line, and saw people from all walks of life. There were mothers with their children, businessmen just getting off of work, elderly in wheelchairs. There were people of every size, age and color, and I was overwhelmed by the gravity and beauty of it all. This election has been a hard one for many of us, no doubt. We are all ready for it to be over. But, at the same time, we live in a country where we have the privilege to vote, for our voices to count. It’s a beautiful thing when you really think about it – that people who are so different have the ability to come together and choose their leader. Many have died so we can have this privilege. Many around the world are currently fighting to gain this privilege because they aren’t afforded the same liberty we have. Don’t believe the lie that your voice doesn’t matter. It does. Don’t allow frustration or cynicism about the election to paralyze you from using your voice. This is too important. We all need your voice. I believe in us, today. We can do hard things. Use your voice and cast your vote. Today, I’m thankful for the guy pictured above. I’m thankful for his silly side, and how it brings out the child in my heart too. I’m thankful for how he can make me laugh even when I’m annoyed or frustrated. He reminds me that life really is too short to sweat the small stuff. I’m thankful for how his logic balances out my emotions, but doesn’t negate them. I’m thankful for his integrity, thoughtfulness, and kindness. I’m thankful for how hard he works. He sets a great example in work ethic, commitment and just plain showing up with all you have every day. I’m thankful for how he pursued me from day 1 through my stubbornness and fear, and how he’s continued to pursue me in the same way every day since. Most of all, I’m thankful for how he’s shown me Jesus. Because of him, I know more of Jesus’ love and relentless pursuit of me. I feel safe and loved with Taylor, and with the Lord. That’s everything to me. Perfect love truly does cast out fear. Our love is far from perfect, but it points to the love we have in Jesus. I’m forever thankful for that, and for the gift I’ve been given in Taylor. Yesterday was one of the best days I’ve had in a while. I woke up this morning with my heart so full of gratitude. The day started off with a group of girlfriends and I heading to a Spiritual Girls Retreat put on by University of Texas College Life. The leadership had asked “older women” (that still makes me laugh that I’m in that category now) if we’d be willing to come and offer short mentoring sessions for the college girls attending the retreat. Cue a huge YES from me because mentoring and getting to talk life with younger women is one of my favorite things. The retreat was held at a camp just outside of Austin. The drive out there was beautiful, but the hearts of the girls we got to meet with were even more so. When our time was over, we all loaded back into the car and couldn’t stop talking about the conversations we’d had. It was so fun to see how God orchestrated divine appointments for each of us, and how the Spirit had worked so powerfully in the short time we spent with each girl. 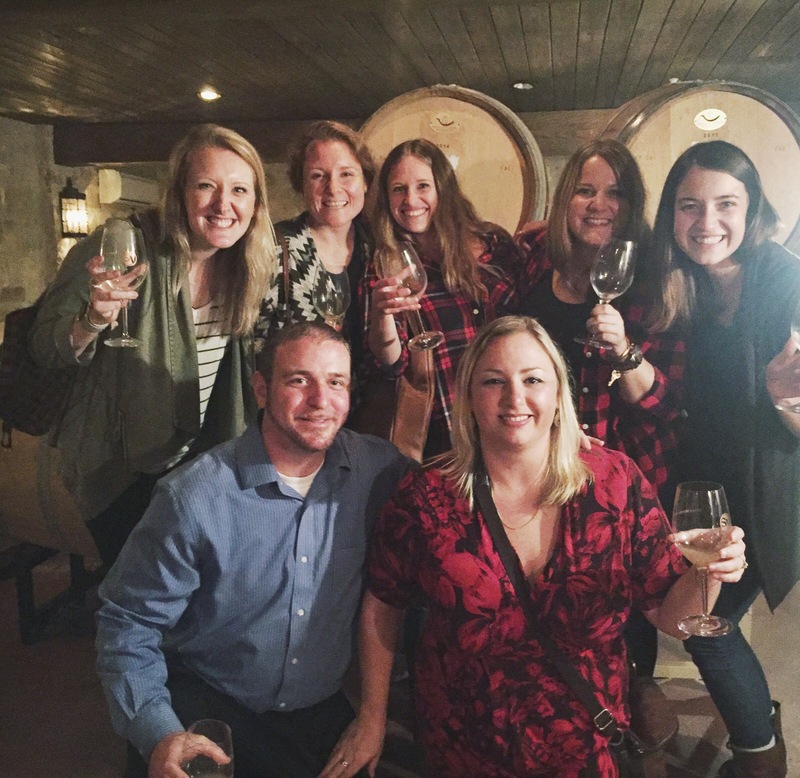 Before we headed back to Austin, we stopped at Spicewood Vineyards for a wine tasting. The rain had stopped, and the afternoon had turned into a beautiful one – cool, cloudy, and breezy. There was a wedding happening, and as we watched the bride walk down the aisle, we were all reminded what a gift love is. After the ceremony ended, a man who was sitting at a table next to us with his girlfriend came up and let us know he was about to propose. He asked if we’d take a few pictures of the moment. Of course, we said yes. After she said yes, we all cheered and raised our glasses to them, gushing with the sweetness of the moment. A few minutes later, we were invited to head down to the wine cellar with them to celebrate further with a bottle of sparkling wine. We laughed, heard the story of how they met, and toasted again to their new adventure. We took photos, and celebrated with these strangers who now felt like new friends. It was such a special gift, an honor to be invited into this moment with them. As I was reflecting this morning on all the events of yesterday, I think I’m most thankful for how God shows up when we invite others into our lives, and when we have the courage to step into the lives of people around us. A 30 minute conversation with a college girl, a celebration with strangers, spending the night with friends who are family; it all happened because we all – college students, my girlfriends and I, a man proposing to his girlfriend, our long-time friends – chose to step into each others lives and show up for one another.